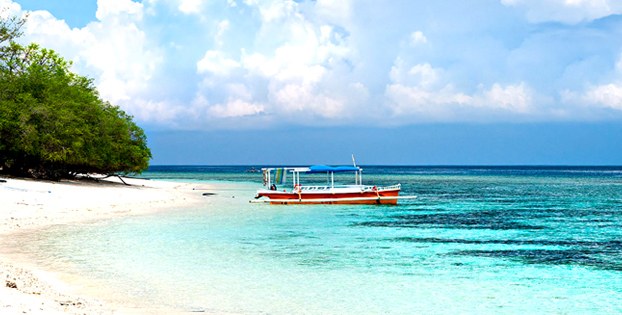 Gili Air is the most easterly of the three Gili Islands off Lombok. Of the three Gilis, this is the island closest to Lombok. Traditionally, Gili Air was seen as the domain of families and couples wanting a quiet, off-the-beaten-path escape, while the rowdier hoardes had their fun on Gili Trawangan. With Trawangan now up scaling so obviously, more and more backpackers seem to be chosing Gili Air as their primary option. This island has more of a rural, established feeling than the other two, and it is no surprise that many of the local Gili Islanders seem to prefer living on Gili Air, and that it has the highest permanent population of about 1,800. By Fast Boat : Most fast boat operator offer route of transfer from Bali to Gili Air. We need about 1.5 hours if we use the boat via Padangbai harbor or 2.5 hours if the boat leave from Sanur or Serangan harbor. Since 2011, there is an ATM on the island. It is located 5 min east of the ferry arrival area.